Learn how Nuance’s Dragon Content Services successfully take the heavy lifting out of delivering content, which is crucial to any automotive assistant. By letting our technology and platform deal with the complexity of the content ecosystem, automotive OEMs can focus on creating innovation that consumers want to see the most. 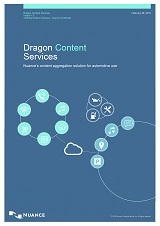 How Dragon Content Services enables OEMs to offer robust and innovative content UX, while reducing technical complexity, costs and time to market.